The AECO member operated ship MS Stockholm assisted in the search. Monday evening, Northern Norway’s Joint Rescue Coordination Centre (JRCC) received signals from an Emergency position indicating radio beacon (EPIRB) transmitting from a position just north of Magdalenafjorden (Magdalena Bay) in Svalbard. The beacon belonged to a sail boat that has Longyearbyen as its home port. The JRCC tried contacting the boat with no response. 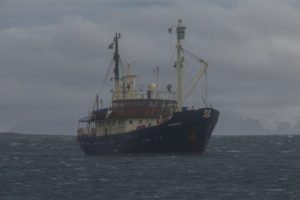 Other boats in the vicinity, including the ship Stockholm, which is operated by an AECO member, were notified and started a search in the area indicated by the emergency beacon. The beacon device was located, but there was no trace of the boat. A larger search and rescue operation was initiated, involving Svalbard’s Search and Rescue helicopter, an Orion aircraft from the Norwegian Armed Forces and the Norwegian Coast Guard. In addition, two civilian expedition cruise vessels were involved in the search, which continued through the night. The sailboat was located 09:15 Tuesday September 19 by the SAR helicopter. Unbeknownst to the ship crew, the emergency beacon had fallen overboard and been activated in the water. Northern Norway’s Joint Rescue Coordination Centre reports that the search and rescue operation was carried out in a well- coordinated manner. The JRCC also pointed out that communications had been a challenge, as is often the case in Arctic SAR operations. This episode demonstrates that passenger ships are a valuable resource in Arctic SAR. Expedition cruise ships sailing in remote area can quickly arrive at the scene and assist SAR authorities and responders. The Association of Arctic Expedition Cruise Operators is working to build dialogue and coordination between SAR entities and the expedition cruise industry. One example is the joint Arctic SAR tabletop exercise that AECO is organizing for the third time in cooperation with Icelandic Coast Guard and the Joint Rescue Coordination Center in Northern.